A novel series of Schiff bases was prepared by the condensation of sulfa-guanidine with 1-benzoylacetone (H2L1), dibenzoylmethane (H2L2), 5-methylisatin (H2L3), 2-hydroxybenzophenol (H2L4) and 1-methylisatin (H2L5). The important IR bands and the main 1H NMR signals were assigned and discussed in relation to molecular structure. 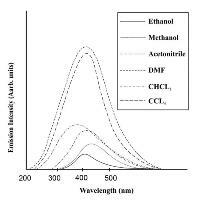 Considerable interest had also been focused on their UV-Vis and fluorescence spectra in organic solvents of different polarity. Also, their absorption and emission spectra were investigated in aqueous buffer solutions of varying pH and utilized for the determination of pKa, pKa* and ΔG* of the ionization process. The biological activities of the investigated compounds were tested against bacteria and fungi.